While most car accidents seem to be caused by the usual factors such as alcohol and drugs, speeding, fatigue and general inattentiveness, a fair number are caused by poor road design. Car accidents in Boston do occasionally occur from a poorly placed sign or inadequately maintained roadway, among other roadway flaws. 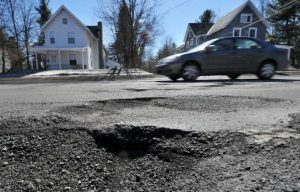 Most roadways are designed and maintained by the states or the federal government or local municipalities that may put up signs or fix potholes or remedy other hazards. A poorly designed ramp or misplaced sign, however, along with other flawed design features, can lead to devastating injuries to unwary motorists. Medians separate motorists traveling in different directions to prevent an out of control vehicle from entering the opposite traffic lanes. Medians that are too low or not situated properly can allow such vehicles to cross and lead to tragic results. Some median barriers may be too rigid, crushing a vehicle or sending it back into traffic. Some medians lack sufficient reflectors to warn drivers at night. Signs warn motorist of existing road conditions, speed limits, rules of the road, irregularities in the road or of other hazards. Signs that are old or damaged are sometimes not replaced or new hazards may appear that a sign may not address. A poorly situated sign may not be seen or overgrown foliage can obscure a sign from view. A significant shoulder drop-off can create a danger for motorists who may lose control of their car and cross over the median and into oncoming traffic. Ramps that are too short or do not allow motorists to exit or enter highways safely can create a dangerous situation for motorists who are not used to the ramp or fail to compensate for its flaws. A roadway that is not properly paved or graded can allow pools of water to accumulate and cause cars to hydroplane and motorists to lose control. Lane changes, uneven pavement, and poor visibility at night or in snowy conditions can render road construction zones as particularly hazardous. Since a city, state or the federal government is responsible for highway design, maintenance and other safety structures on the highways, an injury claim would be presented against these entities. Unlike a typical personal injury claim against a negligent driver for example, the statute of limitations for filing a claim in Massachusetts is different because you must file it pursuant to the Massachusetts Tort Claim Act. There may be other parties responsible, however. A construction company is often redirecting traffic where there is road work being undertaken. Compensation includes medical expenses, lost earnings and benefits, pain and suffering and compensation for psychological damage. Defective roadway design cases are not always easily determined. It takes an experienced car accident lawyer to look at all the factors that can cause an accident and to examine possible roadway flaws or maintenance issues that contributed to your accident. Even if you have a credible case for a highway design defect claim against a city or the state of Massachusetts, government entities routinely deny these claims. Your claim must also be submitted pursuant to the Massachusetts Tort Claim Act or it may be barred forever. Call Burns & Jain today at 617-227-7423 for a free, confidential evaluation of your accident case.